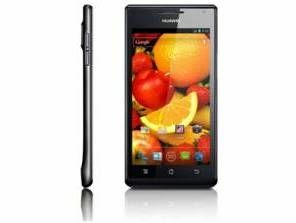 The Huawei Ascend P1 S and Ascend P1 have been announced at CES 2012, offering Super AMOLED screens and the thinnest chassis on the market. The two phones have been developed by the firm to show off its 'style and power' as it seeks to make waves in the smartphone space despite being a relatively unknown brand. However, while claiming the Ascend P1 S is the thinnest on the market, it will be interesting to see how thick that lip at the bottom is, as that's the part that will stop it from being able to tout any records in advertising should it be fatter than the iPhone 4S. The Huawei Ascend P1 S and P1 are almost identical, apart from the larger chassis (7.69mm thick) and a slightly smaller battery for the latter model. Both the phones come with a 1.5GHz dual core processor and a 4.3-inch qHD (960x540) Super AMOLED screen, presumably licensed from Samsung in the same way as the Motorola Razr. Both are offered up with an 8MP camera on the rear and a 1.3MP sensor on the front, with a dual LED flash and the HDR technology used on the iPhone to provide clearer and deeper images. Other than that, the main selling point is both the phones will be coming pre-loaded with Ice Cream Sandwich from the off. However, don't get excited about that just yet, as the Huawei Ascend P1 S has a UK release date of 'early Q3'. This seems doubly unfair seeing as the rest of the world is getting its hands on it in April this year, so we'll have to wait to see if Huawei can compete with the likes of the Samsung Galaxy S3 when July rolls around.